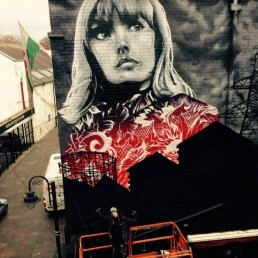 Browse our selected graffiti art mural portfolio below or visit our blog to see the latest updates from our studio. 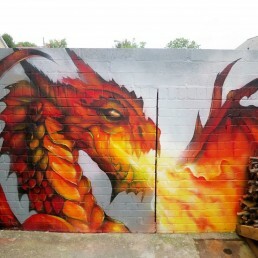 Private commission fire breathing dragon garden mural. 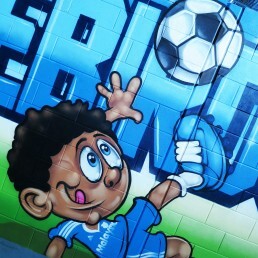 We were asked to design and paint a kid friendly graffiti art mural for the family area of Cardiff City Football stadium. 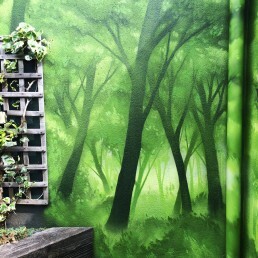 We were asked to design and create a fresh new look to brighten up their pub garden area...I think we ticked all the boxes! 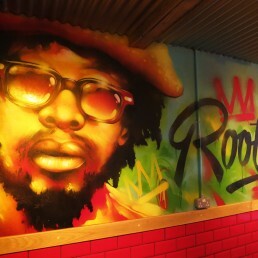 New graffiti mural for Newport's brand new Rootys Caribbean street food restaurant. 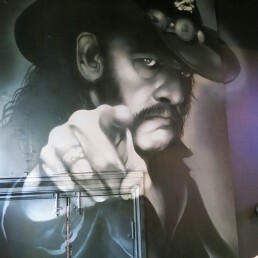 We painted rock legend Lemmy from Motorhead and neon effect Coors signage at Swansea's rock bar Jack Murphy's. 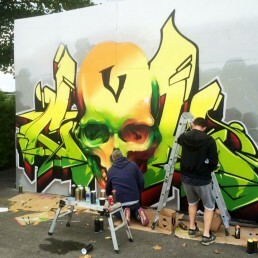 We were asked by Mitsubishi to paint a graffiti art mural demonstration at their "Adventure Advanced Live" urban wakeboarding event in Bristol. The only brief was to only use their branding colours...this is what we created! 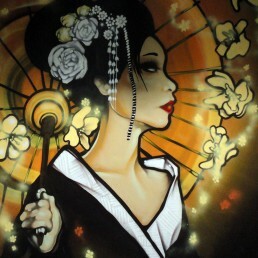 Graffiti art demontration painting is a great way to entertain a crowd and perfect way to advertise your brand. 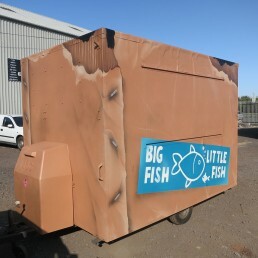 Catering Van/Trailer Commission graffiti art mural for Big Fish Little Fish - Gourmet Street Food. This was a interesting one for us! The brief was to transform a old burger trailer into a cardboard box. We ticked every box on this and this piece of art is such a head turner at any event or even driving down the street. 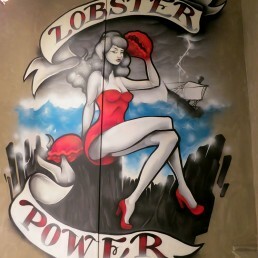 We were asked by Burger and Lobster to design and paint a selection of graffiti art murals to flow around the three story stairway of their new Cardiff restaurant. 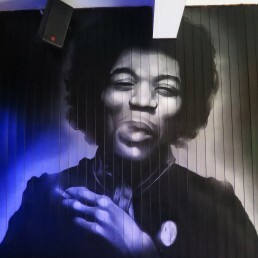 We were asked by Newport's Warehouse54 bar and music venue to transform their grey outside terrace area. 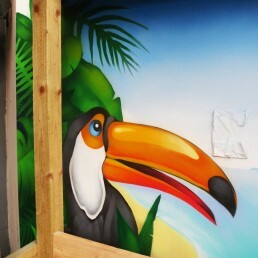 We designed and painted the whole area based on a fresh tropical/tiki themed mural.